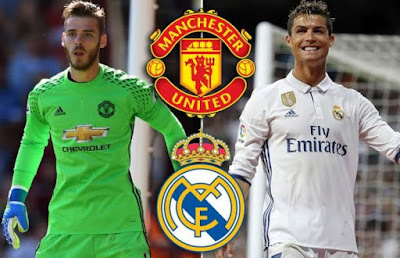 Manchester United will make an audacious attempt to bring back Cristiano Ronaldo in a staggering £175million deal, which could see David de Gea move in the other direction. Last week, Ronaldo said he is ready to leave Spain, after being accused of a £13million tax fraud. Real president Florentino Perez will go public on the issue on Monday, while head coach Zinedine Zidane has already called Ronaldo on holiday to make it clear that he wants him to stay. It is being reported that Ronaldo will only stay at Real Madrid, if they pay his disputed £13m tax bill. United also want to sign striker Alvaro Morata from Real, but it is believed they will pursue the Spaniard in a separate deal.